An opportunity to spend two whole weeks in a quiet outdoor setting – exploring, observing, sketching, and painting – doesn’t come around often. But it did for me, and I enjoyed every buggy minute of it. I just returned from Huyck Preserve, a little gem in the hilltown of Rensselaerville, NY, where each year, several artists are selected to live on the property and produce work that connects the community to the environment through art (COM.EN.ART). 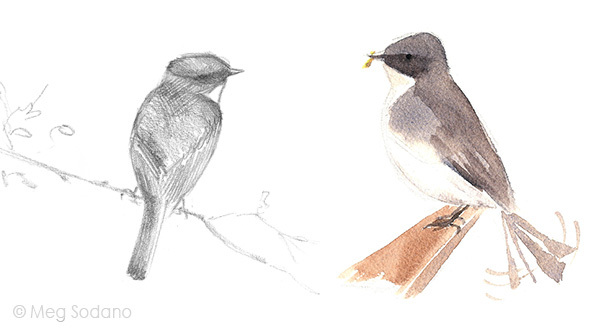 Here, subject matter for a natural science illustrator is abundant and diverse. 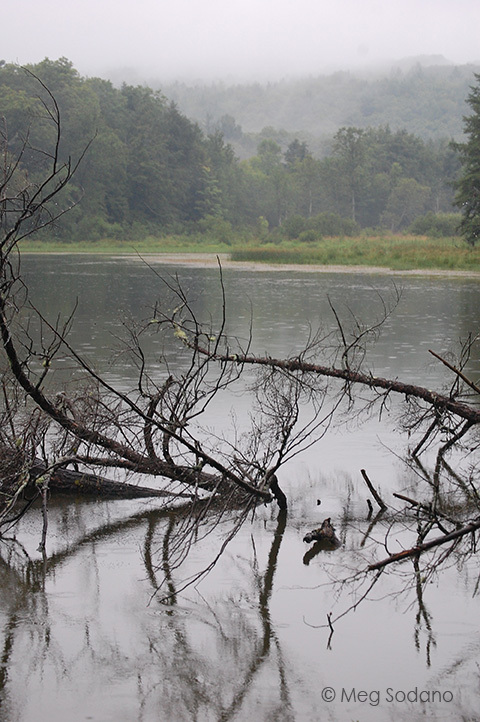 Across 2000 acres, you can wander around a pond and a lake, admire some spectacular waterfalls, rock-hop over creeks, and feel small in a 200-year-old grove of hemlocks, all along a beautifully maintained trail system. 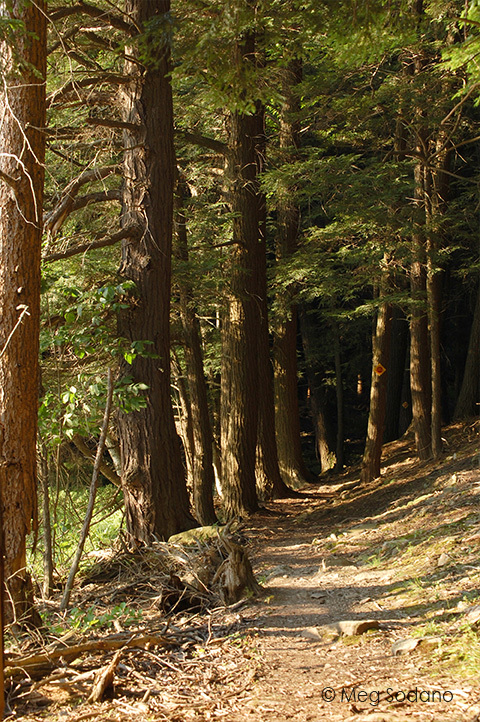 Ongoing ecological research and environmental education make Huyck more than just a pretty place to hike. It is a place of great importance to science and to conservation. Gorgeous spot, right? While I spent the majority of my time on the trails, looking for inspiration and learning about the species around me, I managed to be productive in my little studio as well. 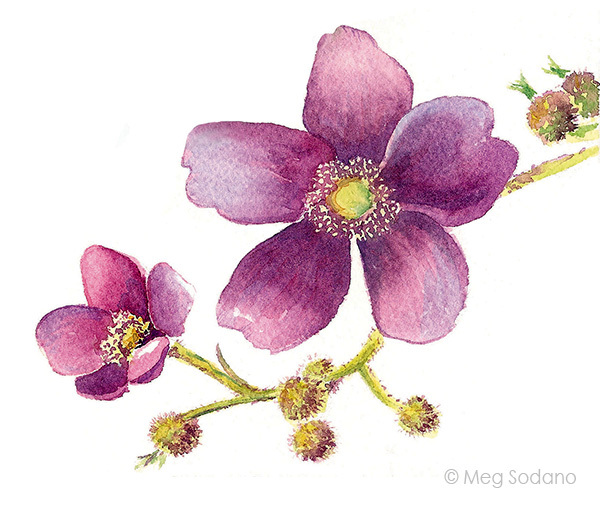 My field sketches and detailed photographs lead to two finished watercolor paintings. 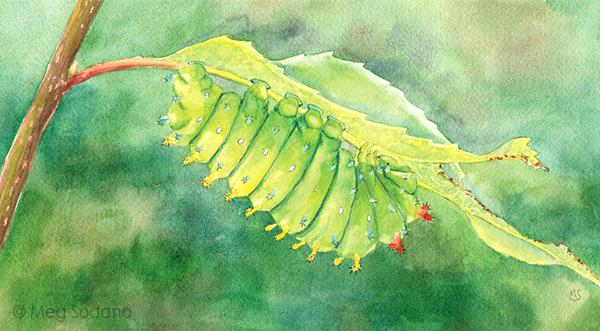 First is a caterpillar of the giant silk moth (Hyalophora cecropia), which is common in the northeast and related to the popular luna moth. I was introduced to this caterpillar on my first day by a scientist studying how caterpillar/moth availability throughout the season affects the insectivorous bird populations. This particular specimen was latched onto an alder shrub next to the porch of the cottage where we were staying, so I was able to watch it devour leaves and grow bigger each day. At first it was about 1.5 inches in length. 16 days later it stretched almost 5 inches! It will continue to grow and destroy that poor alder until it builds its cocoon in the weeds by the ground. After waiting out the winter, wrapped in silk, it will emerge next spring as an adult moth. These moths don’t pollenate. In fact, they don’t eat anything at all. They lay their eggs in the spring and then die, but not before impressing nighttime nature lovers with their patterned brown and red wings. My next painting now belongs to Huyck Preserve, and is part of their collection of natural history art created by participants in the COM.EN.ART program. Visit the preserve, and you will see these works hanging in the visitor’s center and research center. 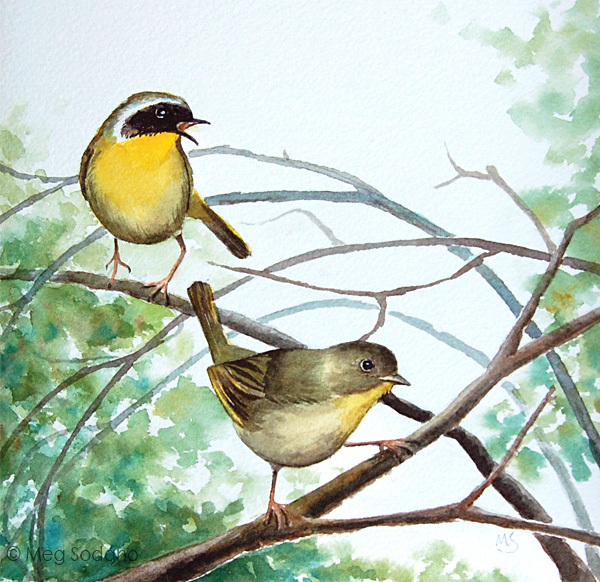 The Common Yellowthroats here (male on left, female on right) are very territorial and make themselves known to travelers along the eastern trail of Lake Myosotis. They were easily roused with “pish pish” noises, and they scolded me from the edge of a dense thicket. I made some gestural sketches and used my camera to capture the details of their plumage, all of which were important references for the final painting. 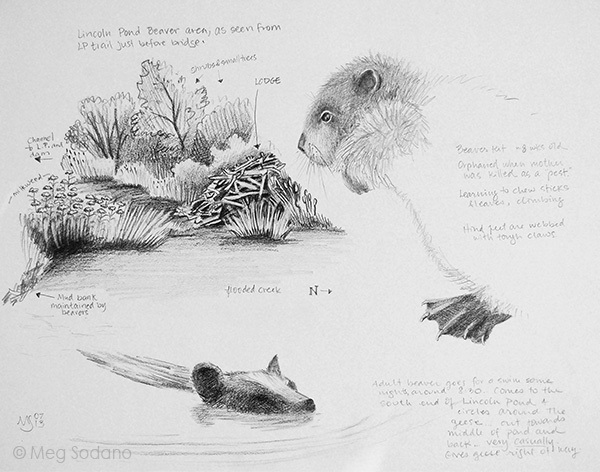 I also gave the preserve a piece out of my sketchbook, a study of the beavers that live in and around Lincoln Pond. Their lodge is shown on the left, with notes about the surroundings. On the right is a drawing of an 8-week-old beaver orphan that was in the care of a local rehabilitator. Look at those leathery clawed feet! It was one of several baby animals she brought to the preserve to share with visitors. 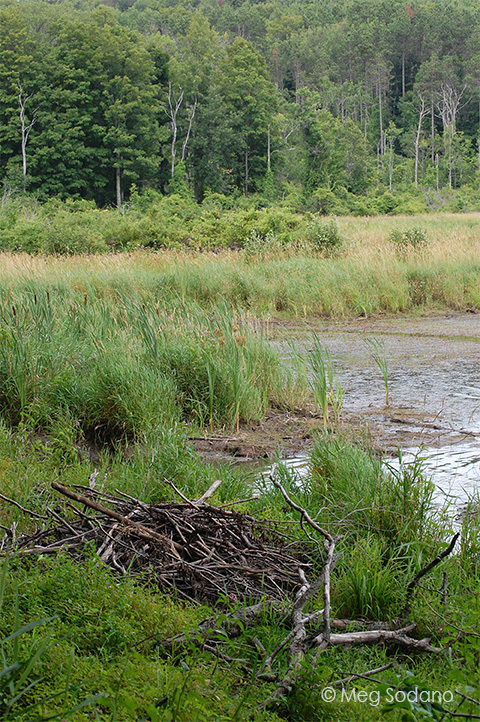 On the bottom left is a quick silhouette of the adult beaver that routinely came out for an evening swim on the pond. I’ll close with some more studies. The resident Phoebes at Lincoln Pond Cottage, who foraged tirelessly for insects to feed their two nestlings, were great entertainment. The babies fledged the day I left. 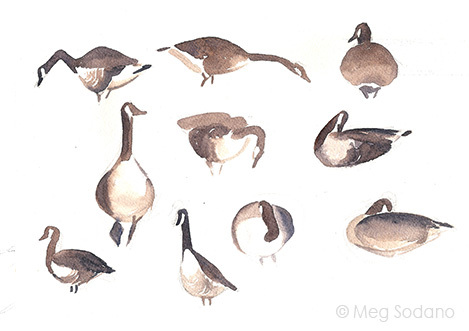 And two families of Canada Geese, an annoyance on the grassy lawn outside the research center, were easy subjects for gestural painting.